Are your lights dim? Does your battery always die? One possible cause could be your car's alternator. At Auto Barn we carry USA Alternators and Bosch Alternators for most cars, trucks or SUV's, domestic or import. What the alternator does is convert the gas being used to drive your vehicle into electricity to charge the battery. Is your car not starting up? We carry car starters by manufacturer's such as USA Industries to make sure your car, truck, or suv starts the next time you need it to. The starter is used to ignite the initial amount of fuel needed to start the engine. 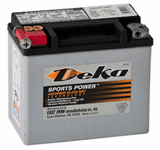 We also carry Deka batteries for those batteries that are dead beyond the charging power of the alternator. Browse our selection below of alternators, starters, and batteries below! Each alternator features zinc plated pulleys and fans, new heavy duty front and rear bearings, hardware and insulators, regulator and high amp welded rectifiers, that meets or exceeds OEM specifications. Each starter features all new hardware and insulators, new solid copper commutators and zinc plated backing plates, that meets or exceeds OEM specifications.